How could Junkrat be made viable in competitive Overwatch? Finding a place for Overwatch's bomb-lobber. 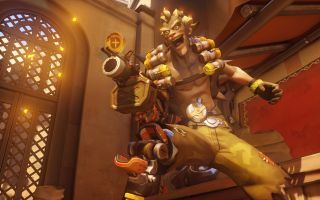 Junkrat doesn’t see a lot of play in high level competitive Overwatch. Before we can talk about possible solutions, however, we need to identify some of the problems. The first is pretty straight forward: Junkrat deals a lot of damage, but isn’t good at finishing off enemies. This makes it easy for the other team’s support heroes to build ultimates faster than your team’s supports can. His raw damage output, which earns him a lot of gold medals, is likely why he's still very popular in lower-skill matches. The second problem is that Junkrat’s ultimate is worse than all of the support ultimates he’s charging up for the opposing team. RIP-Tire has the potential to wipe out an entire team, but if we're being realistic that's not going to happen. Unless you combine it with Zarya's Graviton Surge you're only going to get one or two kills if you're lucky. And even if you do use it with Graviton Surge it's not that consistent because it's so easy to destroy. Chances are that you're wasting two ultimates, not just one. The first thing I’d suggest is that Junkrat should be positioned as an anti-tank hero as an alternative to Reaper, and that his base damage should get cranked up from 120 to 140. He wouldn’t be able to one shot a Tracer, but he’d be damn close. A Reaper that gets close and personal does 140 damage if all his pellets hit its target. And he can always use his Wraith Form to get back to safety. Reaper has more survivability whereas Junkrat is better at zoning. As I want to increase the base damage I’d also suggest that we’d scale down Junkrat’s splash damage and radius so that the splash damage is the same as it is now, but the radius is reduced from two meters to one meter. That way it’d be a little riskier to take damage on purpose (but you could still do it) just to charge support ultimates. It’d also take more skill for Junkrat to deal consistent damage and it’d be natural to go for direct hits on bigger targets – much like Reaper does. Then we have RIP-Tire, the wheel of death that you can hear from miles away and destroy in a matter of seconds. My next suggestion might sound a bit crazy but bear with me: I’d let Zarya shield RIP-Tires. Some would argue that Zarya doesn’t need to get stronger but I wouldn’t look at it that way. She would, however, be necessary in order to make Junkrat work in high level competitive Overwatch. That’s not a unique situation. After Ana was introduced to the game we saw a lot of top tier teams starting to use Genji. To me, that’s what team compositions should be like. You run good combinations of heroes but because you only can pick six, you’ll have to leave some out. Anyway, why do I want Zarya to be able to shield RIP-Tires? Simply put: it’d make a weak ultimate morre powerful. You'd have to think twice before taking damage from Junkrat to charge support ultimates, because you’re ultimately going to trade it for another strong ultimate. If you'd like to learn more about playing Overwatch's tank-busting edgelord, check out our Reaper guide. Let’s compare RIP-Tire to Reaper’s Death Blossom. Because the RIP-Tire has 100 hp instead of Reaper’s 250, it’d be a bit less consistent than a shielded Reaper—but the trade-off would be that you wouldn’t have to put a hero at risk. And then there’s the fact that Junkrat is a sitting duck while he’s using his ultimate. A flanker could potentially kill him without taking any damage. If those are the only differences then Junkrat’s ultimate would be stronger, but there’s more. A Reaper can come in from an unexpected angle and use his ultimate without his opponent knowing that it’s about to happen. The RIP-Tire, on the other hand, is a different story. You hear “fire in the hole!” and the tire itself screeching before it explodes. This gives you a chance to spread out (unless Zarya has used Graviton Surge), use Lucio’s Sound Barrier orget ready to shield your teammates with your own Zarya. When it comes to his Steel Trap and Concussion Mine I’d leave them as they are now: they’re great tools for dealing with flankers. The Steel Trap in particular would be crucial to make Junkrat work. With my changes it’d be important to land direct hits and with the trap you’d increase his consistency when it comes to doing so. One of Junkrat’s biggest weaknesses would remain how easy it is to avoid his grenades at long to medium range. Another point to make is that with my version of Junkrat it’s possible that we’d see more Pharah-Mercy combos in play. You won’t get caught in a trap if you’re sailing through the skies. And because of Junkrat’s slow projectiles, teams would need to use McCree a bit more for hitscan damage. So let’s say a team has McCree and Junkrat on defense. That’d mean they wouldn’t have as much use for an Ana (since they wouldn’t have a Reaper nor a Genji to Nano Boost) and we’d get to see more Zenyatta to help McCree deal with Pharah and Mercy. Balancing a class based game is really difficult and there’ll always be things you haven’t considered. In my perfect imaginary world these massive Junkrat (and Zarya) changes would lead to more viable hero compositions. I’d say that makes it worth a try.